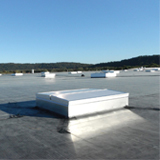 This course will explain the benefits of roof hatch & smoke vent design and life safety. The designer will have a better understanding of code regulations for life safety and will be able to properly size and place vents in accordance with these codes. We will conclude this one hour course with a 10 minute Q&A period for review of the topics covered today.